If you’ve been reading the blog for a while, you know that I try to remind people to look at the Smithsonian Institute/USGS Global Volcanism Program Weekly Volcanic Activity Report. It captures much of the volcanic activity around the world on a weekly basis, so you can catch up on anything you missed (all thanks to the hard work by Sally Kuhn Sennert). Now that the blog has moved, I’m going to try something a little different and combine the highlights from the Weekly Volcanic Activity report with images old-and-new from the NASA Earth Observatory. It is like peanut butter and jelly in the same jar (what could go wrong?). Yesterday’s post gets into the gory details of the rumblings in the Canary Islands, but I did like this picture of the Canary Islands taken in February 2010. 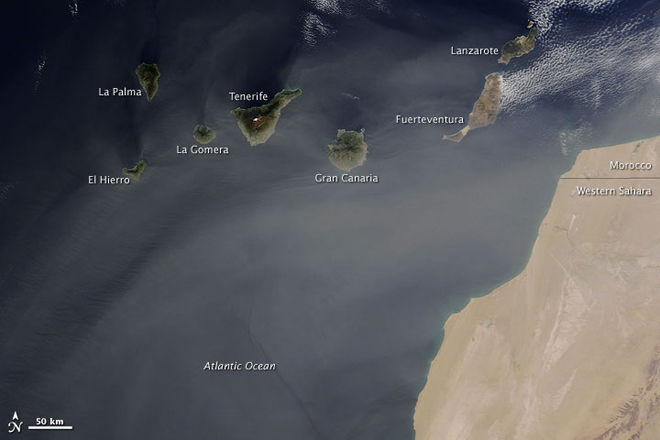 You can see the relationship of the Canaries to Africa and the fact that El Hierro is the furthest west of the island chain. It is also the youngest (along with La Palma) of the volcanic chain and shows how potentially wide the Canary hotspot plume might be.